These machines were developed specifically to provide a viable alternative to the high cost of conventional vacuum trucks. They have the superior ability to recover and bulk bag load all transferred product. The hopper hydraulically elevates, providing just under a two metre ground clearance. Discharge of material is through a proven, simple, yet robust, 400mm diameter valve that is hydraulically opened and closed. Continuous reverse air pulse cleaning of the filter system ensures full performance without loss of suction. An onboard vane type air compressor allows total independence from external compressed air sources. Wireless radio remote control power settings and discharge gate operation is included. The compact design of the VacLoader range complements our similar performing, industry proven, trailer or truck mounted series of Vacuum Loaders but with even lower noise levels and greater portability. Minimal maintenance requirements and ease of servicing for industry were vital factors in the development of these two machine variations. Available as either a three phase electric or turbo diesel drive VacLoader 2550 / 3550 represent an excellent investment into a multi-use vacuum loader. They will be of immediate benefit as a time and money saving business tool that would quickly pay for themselves in the increased safety and/or productivity of your operation. 30kW / 50 Amp / 4 Pin / Three Phase electric motor drive. German or Italian precision engineered three lobe positive displacement pump. 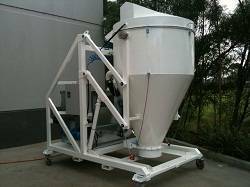 Best suited to in-house plant vacuum loading operations. Easily forklift movable around your plant. Optional, removable, braked swivel castor dolly wheels for relocation into tight access areas. 75kW Kubota Turbo Diesel Engine. Best suited to mobile work as a trailer or truck mount. VacLoaders are supplied with an onboard compressed air full reverse pulse cleaning system. The quantity, material properties and specific gravity of vacuumed products will determine the most suitable filter cleaning method. Contact VacSolutions for details. VacLoaders can be programmed to calculate the weight of materials being vacuumed. At a user selectable hopper weight level these machines will automatically shut down and go into standby mode. This unique feature enables the capture and discharge of an exact amount of material each and every time. These machine is the perfect replacement for your current either aging or inefficient piped ring mains system. VacLoaders will easily interface with your either your 4″ or 3″ steel pipe ring main. VacSolutions can advise you on the preferred setup if you wish to build your own ducted vacuum system. Vacuum trucks generally dump their vacuumed contents directly on the ground or into a skip bin. 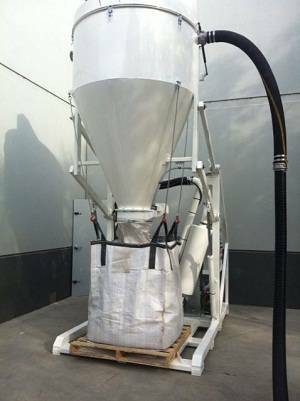 VacLoaders can discharge materials directly into regular spout top Bulka Bags. 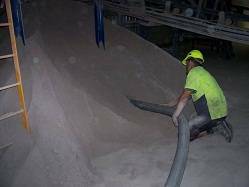 This is a very convenient way to vacuum recover valuable bulk product for reuse or storage. Both VacLoader models are capable of a continuous 24 hours per day, 7 days per week duty cycle. This equipment is ideally suited to rotating shift operations.